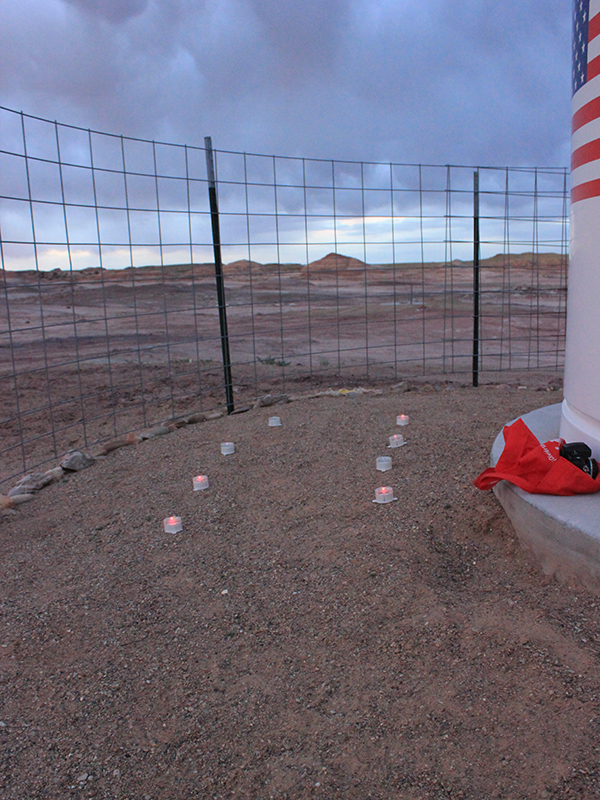 Thanks to everybody who contributed to this year’s field season at the MDRS. We will be archiving this site shortly, and all the content will still be available under a different URL. The next field season begins in December 2017. You can Apply to Join the Crew. Sol 13, our final day of sim! Hard to believe. It seems like we just got here. How could it be time to leave Mars already? I think we are all approaching the end of sim with mixed emotions. This has been an incredible experience and it’s hard to see it end, but we all miss family and friends and our lives back on Earth. 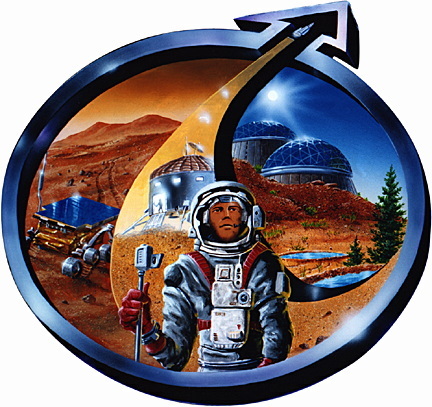 So, today is a day of lasts … last day to gather research on Mars, last day to get footage and photographs on Mars, last meals on Mars … but it’s not all panic and gloom, we also have the excitement of planning out next crew mission back to Mars (hint, hint, Mars Society. You will be hearing from us again soon). Last night, Juan and Cassie went out on EVA so Juan could work on a project. He’s planning to build a runway on Mars with lights and an Air Marshall. He got the lights all set, but the weather didn’t cooperate. It can change on a dime here on Mars! I was filming Charlie in the Observatory for my project when we heard Cassie on the radio. A storm was rolling in and they were heading back. We hope the weather cooperates tonight and Juan’s runway is cleared for take-off! 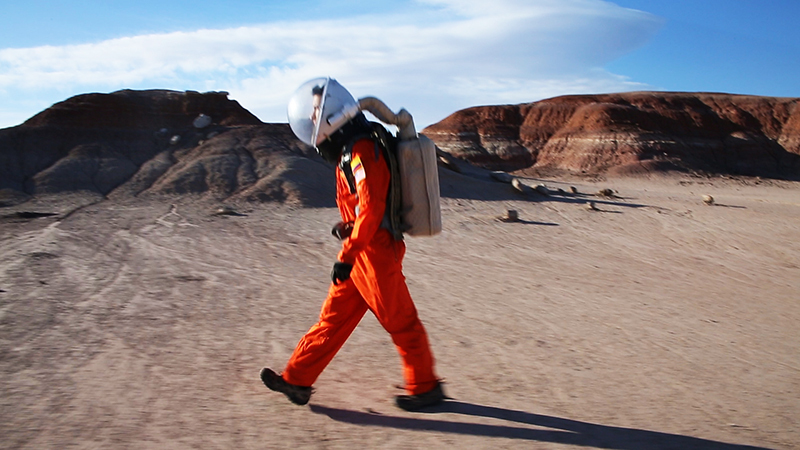 This morning I got in one last shoot with Juan walking on Mars. I wanted a tracking shot and needed to use the rover to pace him. Still not an easy feat to film in a spacesuit, but after a few weeks doing so, I’m now able to focus and follow. After our morning EVA, we treated ourselves to a big breakfast … eggs (yes, the real ones), bacon (also not something often found on Mars, but we had a stash), and biscuits (Bisquick sure isn’t Red Lobster, but we finished them off in a Martian minute!) 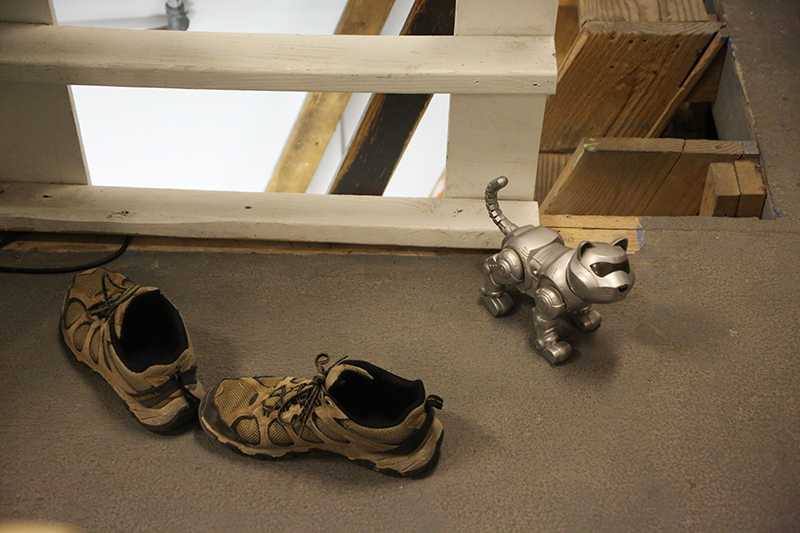 A few crumbs dropped to the floor, which made us remember our Mousetranauts. We hope they are doing well out on the surface of the Red Planet, but if they’re considering coming back to us, we got a Hab cat! Robotic, yes, but seems to do the job (or at least amuse us with its meowing and purring). We are all busy writing final reports and sharing files. “Hey, I just gave you some footage shot down Old Faithful (incase you’d don’t remember, Old Faithful is our toilet) when she sprung a leak “. Ahhh, the memories! Editing our final report down to under 2,000 words is a heroic endeavor, requiring ruthless slice and dice editing skills. While this ruthlessness was going on upstairs in the Hab, Juan and Charlie were downstairs trying to recreate the experience of showering on Mars. Their project generated conversations about Mars gravity and its effect on the arc and density of a stream of water. 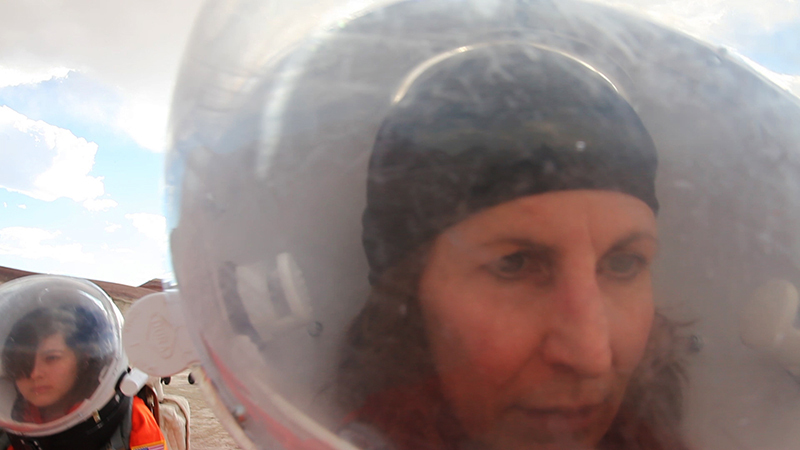 We received a radio call from Dr. Shannon wondering when we were going to break sim and mark the end of our mission. We had been thinking about going to sleep on Mars and waking up tomorrow on Earth (super powerful rocket! ), but it seems there were some details to work out on getting us to our respective shuttles back to Earth … so we decided to break sim in the afternoon. We thought it was a bit anticlimactic to just decide to end, but necessary. Little did we know. Nothing anticlimactic about our ending! Juan needed to film one last project. He suited up and the rest of us stepped out of the Hab in earthly clothes, but with cameras in hand. 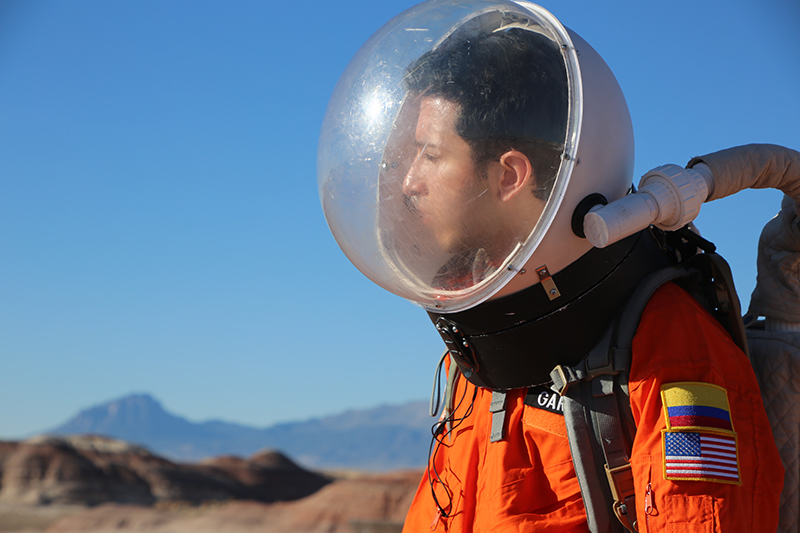 We struck out across the Martian landscape till Juan found the perfect spot. We set up our cameras (much easier out of sim) and turned them on Juan. 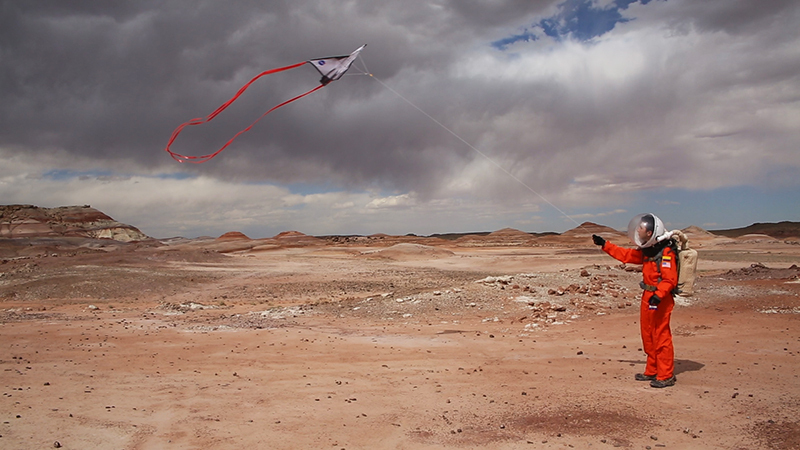 The wind picked up, Juan raised his arm and a kite shaped like the shuttle rose in the air. A perfect ending to our mission. Our shuttle home. 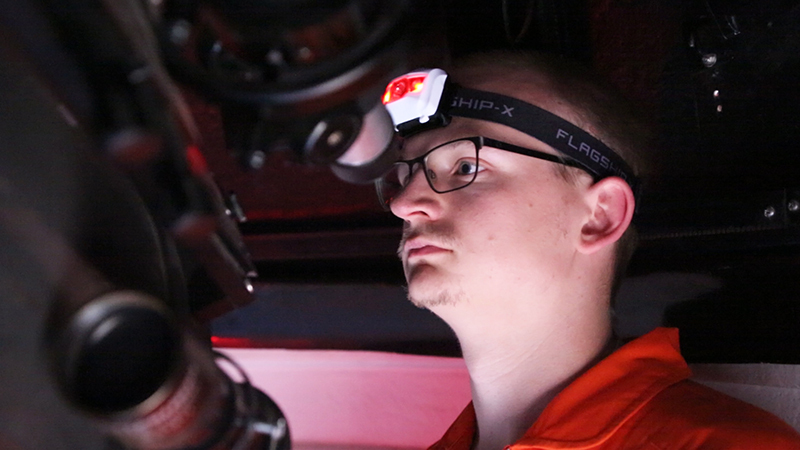 Mission Status: The last day of sim is upon us and all have mixed feelings about leaving Mars! Sol Activity Summary: EVA #17 was fine for Juan and Charlie to finish some last-minute projects. We collaboratively worked on our End of Mission Summary and looked back on all the projects we accomplished. We left simulation around 4pm and did some outside work while we still could. Dr. Shannon came to congratulate us on a successful rotation and we have been chatting with her ever since! Look Ahead Plan: Going back to Earth! Anomalies In Work: None at the current time. Crew Physical Status: Everyone is feeling great! EVA: The EVA today was around the Hab. Reports to be Filed: end of mission summary, journalist report, EVA report, engineering report. Support Requested: None at the current time. The morning started with fully functional pancakes. Charlie and Janet discovered the recipe to solid pancakes was to use real butter from Earth instead of dehydrated butter dust. The pancakes grew large and fluffy with the lower amount of oxygen on this planet. Charlie and Cassie drove to Green Mars Canyon this morning. 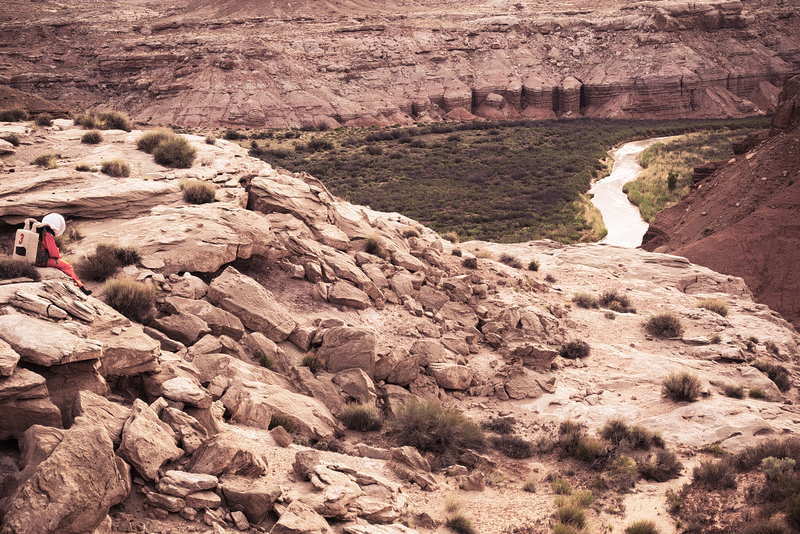 A spectacular Mars canyon only 15 miles roundtrip on ATV’s. 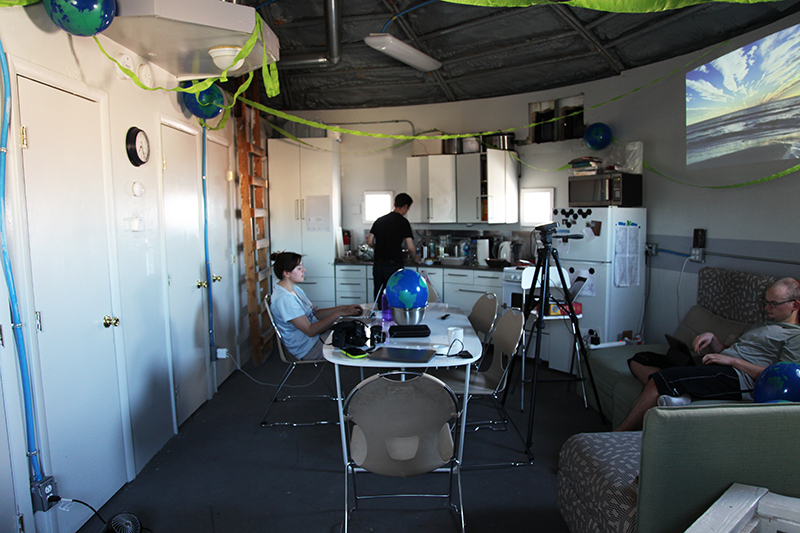 The inside of the HAB is spotted with Earth Balloons from Earth Awareness Day yesterday. In order to maintain awareness of our home world, the living quarters of the HAB was decorated with a projection of scenes from Earth. This included waterfalls, sunsets, flowers waving in the wind, and birds flying. I organized a compilation of greetings from family and friends. The event was followed by a screening of Hidden Figures. Today Charlie had a moment of inspiration. He proposed we use his magnifying loupe and my lasers to explode some balloons left over from Earth Awareness day from yesterday. 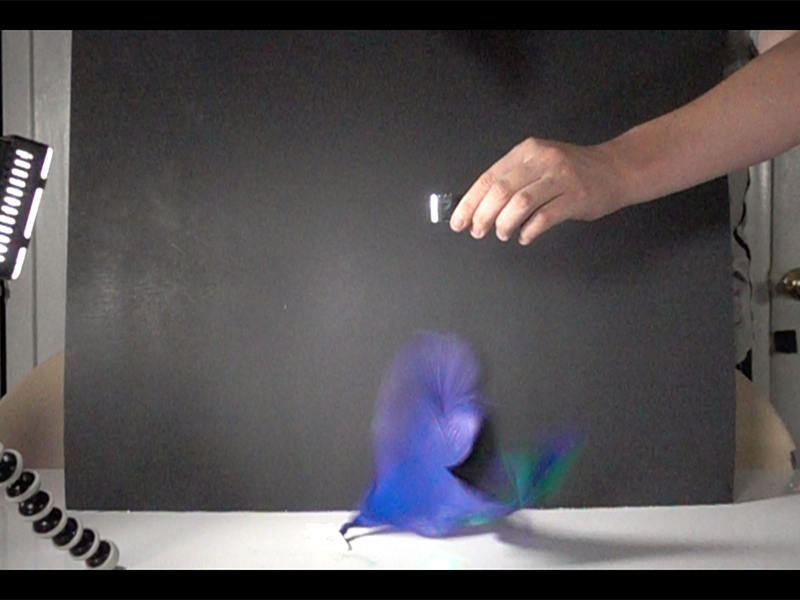 Of course we would record the experiment in slow motion. For lunch, Janet was kind enough to prepare mac and cheese and broccoli. Charlie made Chili and bean dip. We played another game of CATAN, to great frustration for too many reasons to describe. Nobody could get clay, and therefore nobody could build roads. I have been practicing air marshalling signals. These are the specific gestures used with air marshalling wands to direct airplanes. I have been learning ones used to direct airplanes, as well as developing gestures to direct rocket ships landing and taking off from a runway I will build. We had planned to install the runway outside in a flat area in the Mars terrain. For our evening EVA, Cassie and I journeyed into the stormy environment outside of the HAB. We had been waiting for the gray clouds to clear. Cassie brought her medium format camera to capture portraits. While setting up the lights for the runway outside, stormy conditions picked up. Cassie called HAB so we could be notified if the noises we heard were rumbling thunder or the wind because they sound the same from inside our space suits. We packed up in a hurry just as the very dark clouds were swallowing the sky. The hills behind us started to glow in every shade of gold. Pockets of sunlight glowed in a spectacular fashion in the last instances of afternoon light before the storm. For our safety, we made it to the HAB as soon as possible. Mission Status: Whole crew is starting to realize how close our mission is to being over, and there is a mix of emotions because of it. 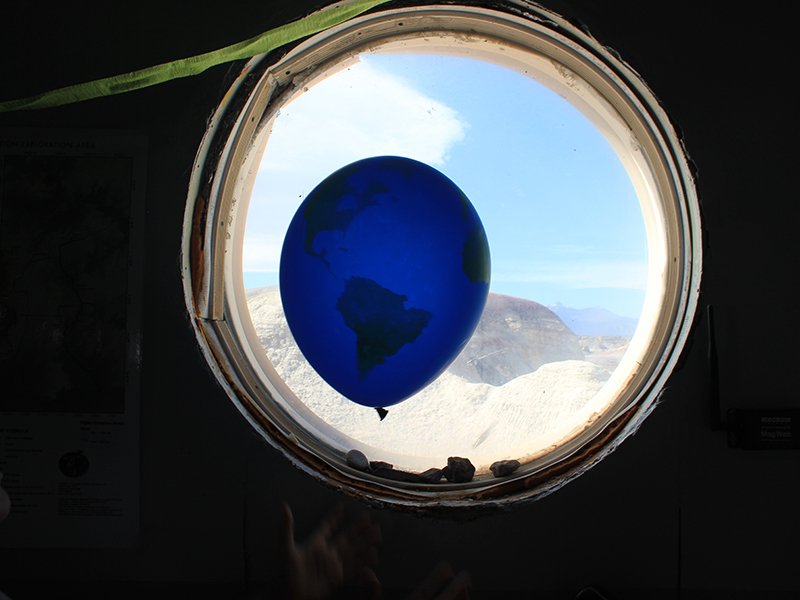 Sol Activity Summary: Last night’s surprise by Juan included an “Earth Party” with balloons and streamers as well as a video montage of clips our friends and families had sent us from Earth! It was such a great event (although I do worry about the state of the Earth, as a few of our family members claimed Earth was in a chaotic state…). After that, the four of us watched Hidden Figures together. Morning EVA with Cassandra and Charlie proved successful, as they traveled to Green Mars North – the farther mission on ATV so far. What a beautiful sight to be held, there. As the sun got hotter, though, they realized they couldn’t stay long and made the long trek back to the Hab. We are now awaiting the evening EVA (about to start). Look Ahead Plan: EVAs planned for tomorrow. Not much else besides writing reports and putting the finishing touches on our projects. Weather: Warm and windy, with threatening clouds all around. Crew Physical Status: Slight panic to get all our things done before sim ends! Otherwise, fine. EVA: Both EVAs today were around the Hab. Reports to be Filed: journalist report, EVA report, and EVA request, engineering report. 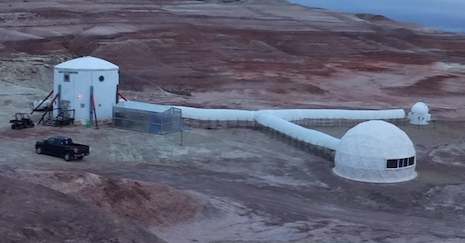 Mission Status: A really hot day on Mars leads to sleepy crew with much still to do! Sol Activity Summary: Last night, Janet and Charlie were able to track both Jupiter and Saturn through the observatory telescope! It was amazing! The whole crew was out looking at the stars, quite the bonding experience. Around 1am, we all made our way back into the Hab. Morning EVA for Juan and Janet around the Hab was successful. 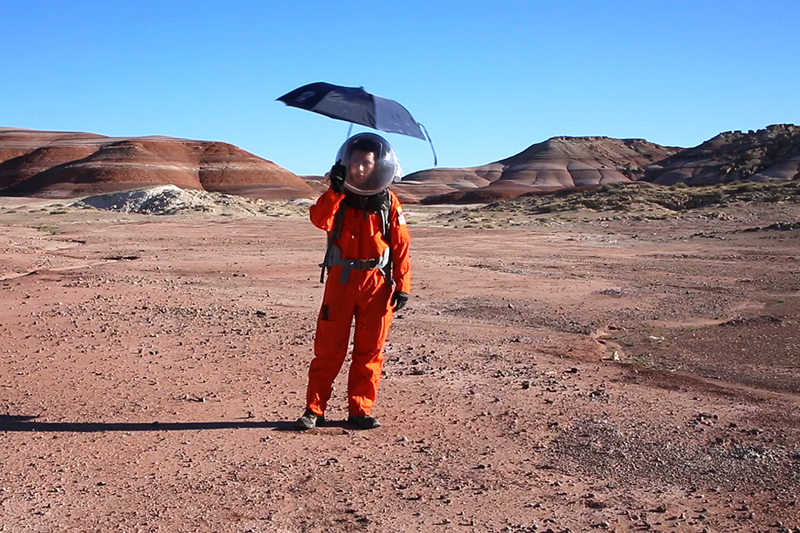 Juan performed tasks to test the Mars atmosphere, such as testing to see if compasses work on Mars (they don’t), whether an umbrella is needed (nope, it doesn’t rain on Mars), and whether a lighter would work (it’s doesn’t, not enough oxygen). Midday lunch was made by Charlie – delicious mac ‘n cheese. We all worked on our projects inside the Hab. Afternoon EVA was brutally hot. Janet and Cassandra got what they needed done, however their last task was to move Dr. Shannon’s water tank back onto Deimos. The water tank was definitely too heavy for the two of them, so with the help of Charlie they were able to get it up onto the rover. Teamwork! Look Ahead Plan: EVAs planned for tomorrow. Juan has a special treat for us tonight (it’s still a surprise), we hope to have more time in the observatory and watch Hidden Figures. So many things, so little time left on Mars. Anomalies In Work: None at the moment. Weather: Hot, hot, hot. Humidity hovering around 15%. Crew Physical Status: Feeling lethargic due to the heat. Support Requested: We are wondering between CapCom and Shannon whether we can expect the refit crew to arrive in a few days? As we plan out our remaining EVAs and activities, we also want to make sure that everyone can make their flights/get back to Grand Junction. Any info on this would be great! After incredible patience, encouragement, and guidance from star man extraordinaire, Peter (my Astronomy Ground Support), we had successful viewing and imaging in the Musk Observatory last night! Charlie and I opened the dome around 22:40 (10:40 pm) and were able to finally complete a two-star alignment. It took both of us, one on the telescope and the other using a laser pointer, to identify three calibration stars for the alignment. 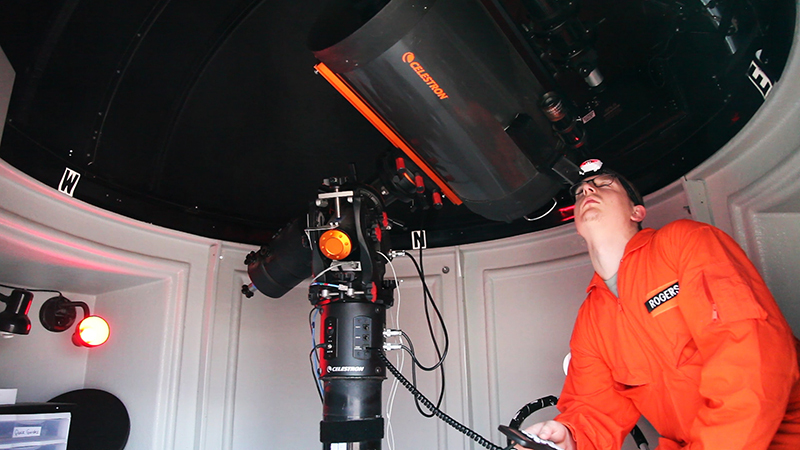 Once we were aligned, we slewed the telescope to Jupiter and saw three of Jupiter’s moons! 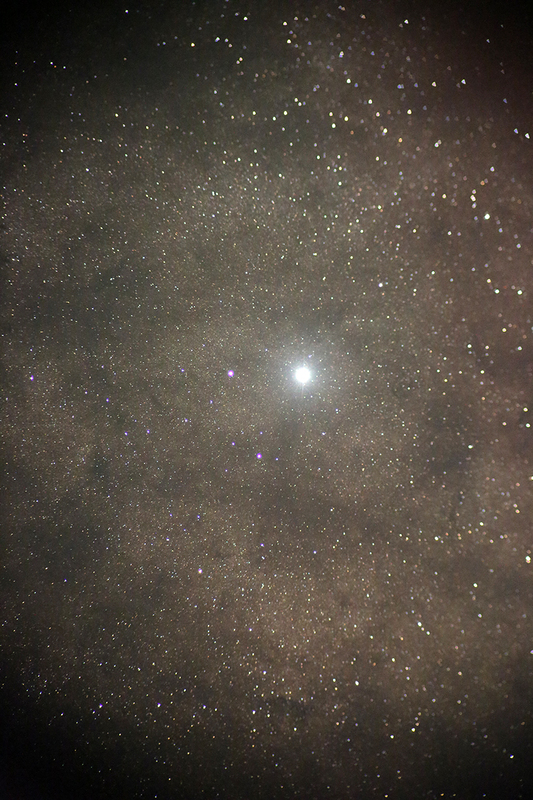 We were so encouraged that we bravely attached my camera to the telescope to try and get some shots. We viewed and photographed M81, and Saturn too. Apparently, we were pretty loud in our excitement as Cassie and Juan showed up. We all took turns viewing and trying different exposures. Getting a good focus on the camera is challenging, but we’ve got a few more nights to master it. We closed up the observatory around 1:30 am, trying not to think about the few short hours to our 7 am EVA time. I got up at 6:40 and groggily struggled into my spacesuit. 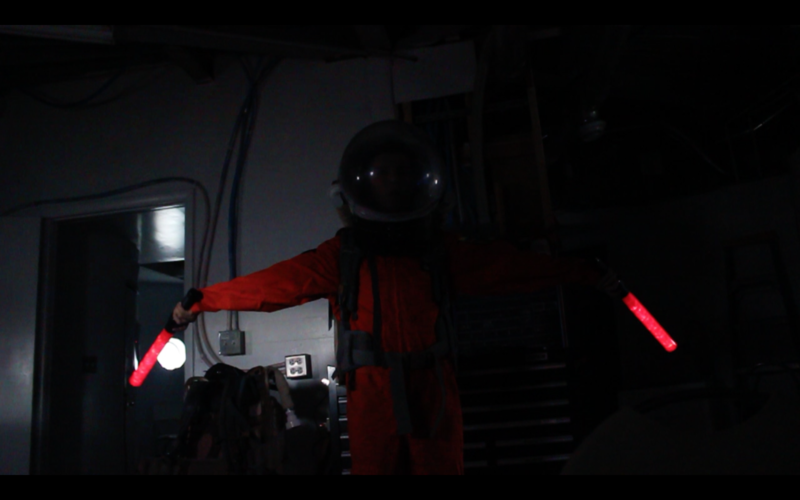 Juan and I grabbed our supplies and entered the airlock. I think we both took a one minute naps during the pressurization. I had a couple shots around the solar panels that I wanted to get and Juan was a willing astronaut/model. Then it was my turn to be model, focus dummy, and camera person for Juan. Dr Shannon had radioed us that a journalist who had not been cleared for landing had made the trip anyway and would we mind if he took photos of us from a distance. We said sure, but I think the journalist got quite a surprise as Juans’s projects included things like holding an umbrella and spraying bug spray on his spacesuit. 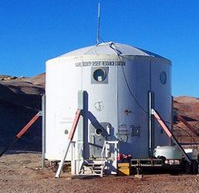 He was visually exploring things that would be futile or fail on Mars. I can only imagine what the journalist thought. As if wandering around in an orange spacesuit wasn’t strange enough. Lunch was mac and cheese again. Sometimes, on Mars, you just need some comfort food … and since we are out of Red Lobster biscuits, mac and cheese did the job. Our conversation at lunch was about power structures, power sources, voltage, and eventually digressed into blowing stuff up. After lunch, the realization that our mission is soon coming to an end hit us. The need to schedule the next couple of EVAs had an urgency that bordered on frantic. It would be tough to get back here to Mars if we missed a shot. 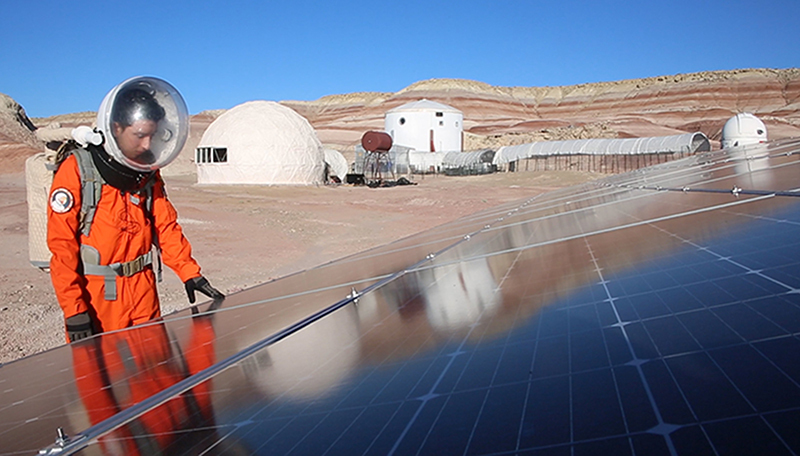 But soon we relaxed back into life here on Mars, in our Hab, talking zero Gs and camera equipment. Cassie is taking pictures of all us, and today she shot Juan in his stateroom. We are all really respectful of each other’s rooms as it’s the only real privacy we’ve got. As Cassie was setting up, we got a peek into his room. He’s been holding out! It’s so full of cool stuff. 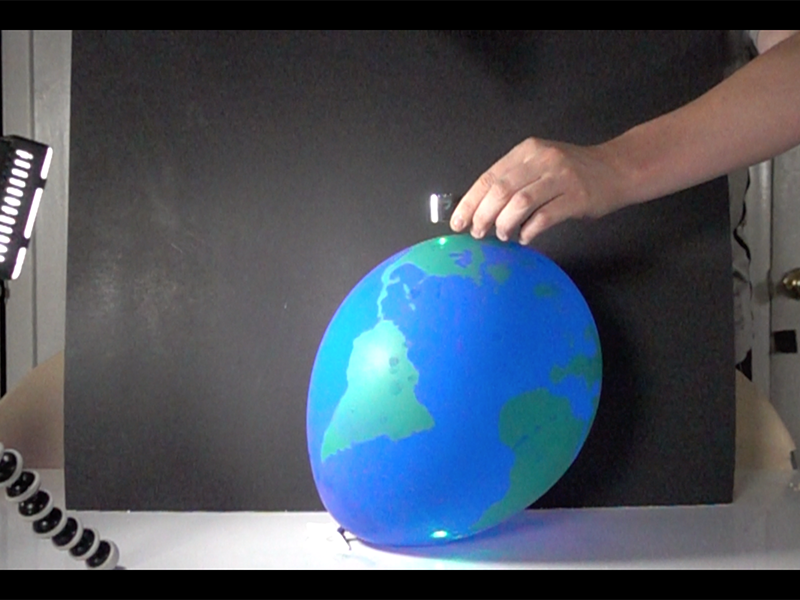 Iridescent paper, airplane marshalling wands, countless lasers … and Cheetos! Totally holding out! Hey, in case you were wondering, our Hab is smelling fresh as daisy. Thanks to the heroic effort of Charlie, who braved the lower depths (remember that scene in the Martian when he was growing potatoes) and Juan, who assisted Charlie in rigging the fan in the ceiling vent above, we are sitting pretty. Echoing the words of Juan, “We are naming a Martian mountain after Charlie”. The plan for tonight is an EVA at 18:00 (just Cassie and myself … the women of Mars), followed by a photo shoot at the observatory, followed by a special dinner made by Juan, followed by filing our reports, followed by a movie night (and if the sky clears up, followed by more telescope viewing). Think we’re gonna need a longer night … maybe we should have gone to Mercury.